Post length 1451 words. Read time 6-8 minutes. 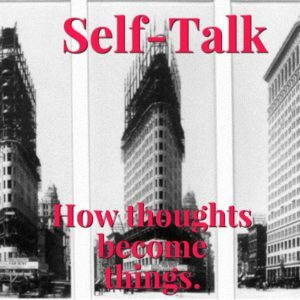 Self-talk is comprised of the things that you think and the words that you say. The thoughts that you think do manifest themselves in the outside world. For example, have you ever had a thought come in to your mind that completely changed the way your body felt? Have you ever been minding your own business when a thought came to you and you began to feel anxious? Perhaps you once had a thought that was chilling? Maybe you thought of an important person in your life and suddenly felt warmth and peace. If you have experienced any of these feelings, then you have experienced your thoughts manifesting themselves into your physical experience. Thoughts truly become things and in this post I will introduce you to a universal law that is paramount for you to understand and master in order to create your ideal life. Have you ever heard the phrase “thoughts become things”? If you have not then this blog post could end up becoming the most important thing you have ever read. The law that you are going to learn, if applied as I’ll show you, will change the trajectory of your life. The universal law that thoughts become things simply means that whatever you think about consistently, whatever it is you are focusing on will come to you. It is known as karma, the law of attraction, metaphysics, and other names. Call it what you will, but the law is the same. Where you put your attention you see results. Want a better bank account? Pay attention to your finances daily. Want a better body? Pay attention to what you put into your body. Want a better relationship? Carve out time to spend with your significant other. Want to be broke, fat, lazy or stupid? Don’t pay attention to your finances, your diet, your ambitions, or your mind. Where you focus your attention you will see results. Where your thoughts are, your focus will follow. Each day on average humans have 60,000 thoughts. When you stop and consider that there are 86,400 seconds in the day you realize just how much thinking you do. Thoughts can be about any and every topic imaginable. They can be random. They can be habitual. They can occur at any frequency in between too. These thoughts are the things we say to ourselves all day, every day. The self-talk that you and I play out each day determines what we bring about, or manifest, in our lives. Allow me to explain how thoughts become manifested. We have countless thoughts each day. Most of them are fleeting. They come, they go, and we don’t pay attention to them on a conscious level. Few people are conscious of their thoughts and self-talk if it isn’t their body telling them they are hungry or have pain or some other kind of physical feedback. Becoming conscious of your thoughts requires self-awareness. Self-awareness means “the conscious knowledge of one’s own character, feelings, motives, and desires.” Being self-aware shines a light on exactly what your self-talk is. The thoughts that continually show up in your self-talk become ingrained in your mind due to their frequency. Through constant exposure, these thoughts become your beliefs. It is a fundamental concept in advertising; get your message across to people frequently and repetitively. Tell people the benefits of your product enough, consistently enough, and they will come to believe it. Beliefs become the words we speak. To observe just how frequently you speak about your beliefs take a moment to be observe how many times you start a conversation or sentence with “I think” or “I believe”. You may be surprised just how often you are communicating your beliefs. The definition of communication is “the successful conveying or sharing of ideas and feelings”. The definition of idea is “an opinion or belief”. Therefore, all of our communication can fall into the bucket of expressing our beliefs to those whom we come into contact with. As in advertising, you are transmitting your beliefs and ideas to those around you and you are also transmitting them to yourself. When you constantly speak your beliefs aloud you are programming yourself and those around you to act in line with those beliefs. I use the word ‘programming’ intentionally. Just like a computer program that tells a computer what to do, the words that you speak are a program to your mind telling you how to think and behave. The words we speak become our actions. Through the repetition of verbal statements, a practice known as autosuggestion which is an audible form of self-talk, you become programmed to believe whatever you speak. Therefore our words have tremendous influence over our lives which we barely recognize. I know this from personal experience. In 2014 I made a decision to change some of my language. One day it dawned on me how much I was saying “I hate” this or that. It was all trivial items, things like sports, or television shows. I realized that I was focusing a disproportionate amount of energy on things that brought me some level of pain. I did not consciously know this law, but I knew that I would be better off if I cut out the words “I hate” from my vocabulary. As I look back now some three years later I am amazed that those words never come out of my mouth. I am now able to brush those things I used to hate off. Those things don’t take up rent in my mind. If they do come to me it is just to say hello and then they leave. By eliminating the words “I hate” from my mind I am open to look for things I like. I look for things that can serve me. I can focus on the things that will move me towards my goals. My focus can go from looking at things that bring me pain to focusing on things which will bring me joy, both long term through discipline, and short term through actions that yield immediate positive results. Actions are the things we do on a daily basis. They can be habitual like grooming, or they can be less frequent such as going on trips. Action is defined as “the fact or process of doing something, typically to achieve an aim.” Therefore action is a pre-requisite of any and all achievement. The larger the aim, the more action that is required to achieve it. If you are reading this blog you likely are a person with goals and a plan to work on those goals so you can achieve them. You know that your actions are going to move you either closer to your goals or further away. Actions like balancing your checking account, reviewing your statements, and budgeting your money will move you towards a better financial future. By the same token, by having inaction in these areas and neglecting them you will quickly find yourself in a worse financial situation. Taking actions that move you towards your goals are important. But what good are they if you do them infrequently? What good is it to exercise once per week if your goal is to be in optimal health? Would you expect to be able to run a marathon if you did three training sessions over two months to prepare? No. Both of these examples are good actions, but neither of them are good habits. You will either be able to master your habits or you will become a slave to them. They will either empower you to live your ideal life, or they will enslave you and prevent you from living your best version. This is the power of habits. There are many books about habit and one that I recommend you read for more education on how habits work and how to make them work for you is “The Power of Habit” by Charles Duhigg. By having habits that move you towards your goal and not away from it, you are creating a destiny of success and achievement. Our success does not come from pulling off the incredible one-time event. Our successes come from working on the fundamentals every day. Our success comes through our habits. In part number two I will show you how to make this powerful law work in your favor. I will give you actionable steps to purposefully instill the type of thoughts that will lead to the destiny that you want. The good news is that the only change that needs to be made is what you think. The beliefs, words, actions, and habits will change of their own accord.